A wall TV holder is totally different from a conventional wooden TV stand or table. This is basically a wooden installation that is fixed on the wall and the TV device is attached to it. This keeps the TV on a safe height and distance from the kids that might harm the device. Along with a certain safety measure, this is also a sort of decoration piece for your house. This wooden installation hanging on the wall makes a pretty cool impression. 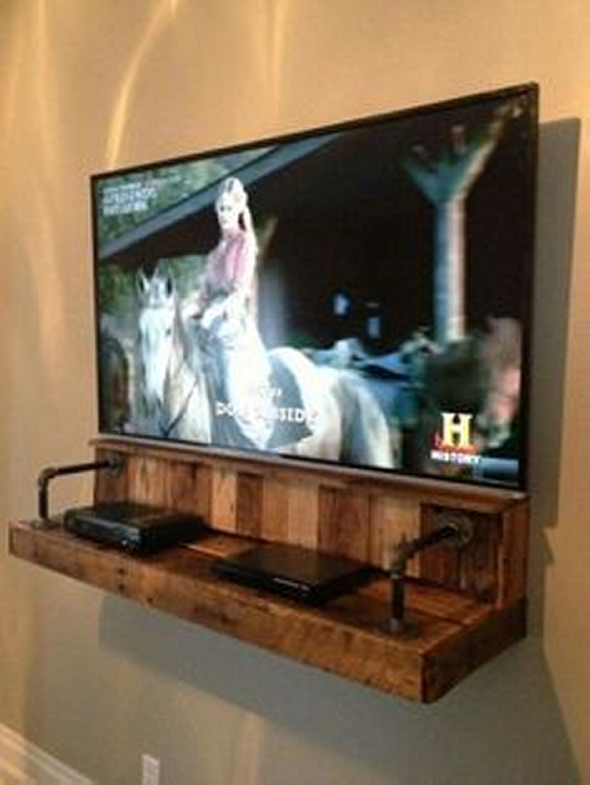 So it can easily be said that a pallet wall TV holder is far better being a multi purposed wood furnishing item. 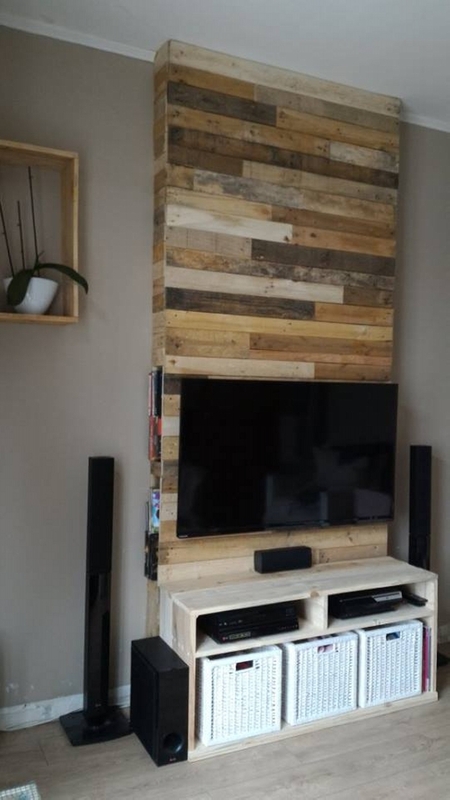 This is just a simple wall wooden pallet TV holder. 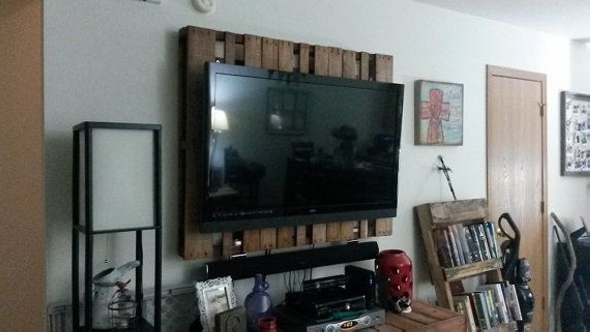 It feels like plain wooden pallets are just collected and hanged on the wall simply, and a huge TV device is installed on this wall wood pallet holder. It really looks great inside a decent room setting. 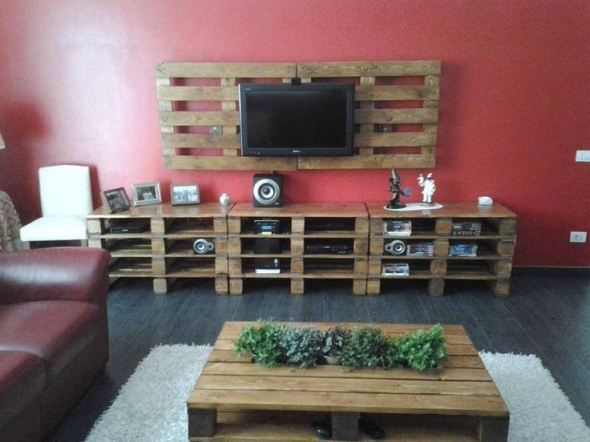 Wow, can we call it a wood pallet TV rack, or shelf, or holder? You can name it whatever you like, but the matter of concern is its utility, practicality, appearance and cost effectiveness. This is a perfect wood pallet installation that not only holds the device but also provides some additional space for other accessories. Now this one is just more than a wall TV holder. This seems like a long and tall wood pallet wall cabinet. Though some rough wood pallet planks are used in making this wooden object. It has also got extensive wooden cabinet right below the TV holder. 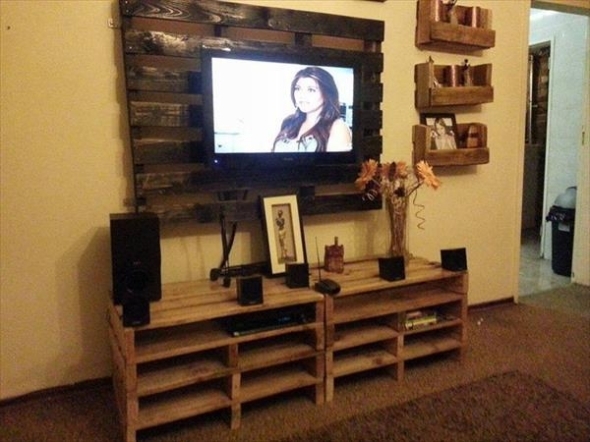 This matter has been discussed countless times that just being a smart wood pallet crafter you can still make the best use out of these broken and deteriorated shipping pallets. And this one is the best demonstration to show this quality. 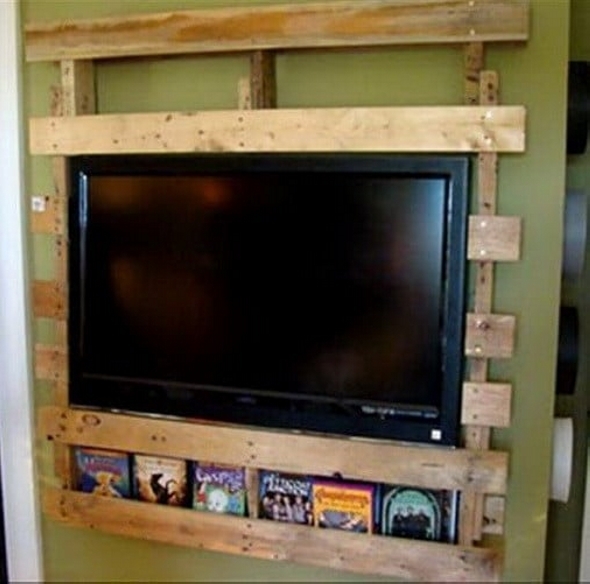 Just switching towards some simple and decent wood pallet TV holder. This could be an ideal installation for a simple small flat where you have the issues of available space. This sleek and simple TV holder would save you lot of square feet that could have been captured by the conventional wooden TV stand or full fledge cabinet. Simplicity has got its own charm, this doesn’t ever need any cosmetic measures. 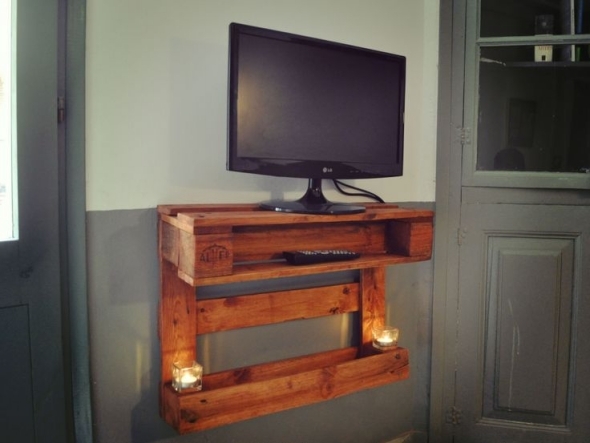 And you can always apply such simple and cute wood pallet TV holders in small homes with less lavish arrangements and home interior. Not only would it bring style to your home, but would also save a lot of bucks. 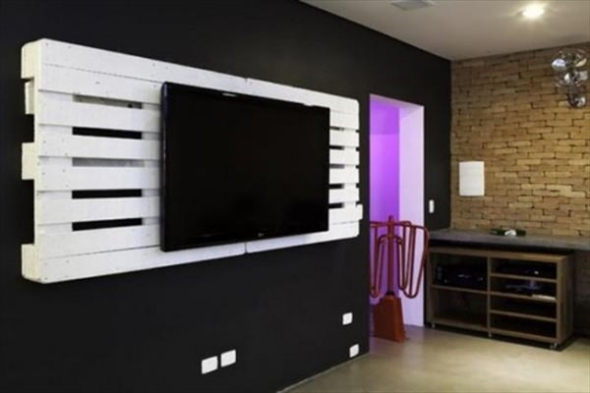 Despite of being pretty sufficient for holding a large TV device, you can still go for some additional wood pallet stands if you have got the sufficient space and also some extensive supply of shipping wooden pallets. You would be provided with ample storage space as well. And lastly you can just keep it as simple and straight like this one. 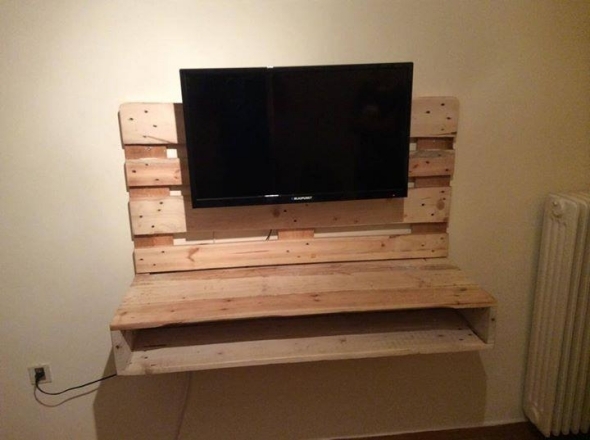 This is s straight wood shipping pallet TV holder, that has got some additional built in space on the lower portion. Place your movies collection on these built in racks, just grab the DVD and get started.